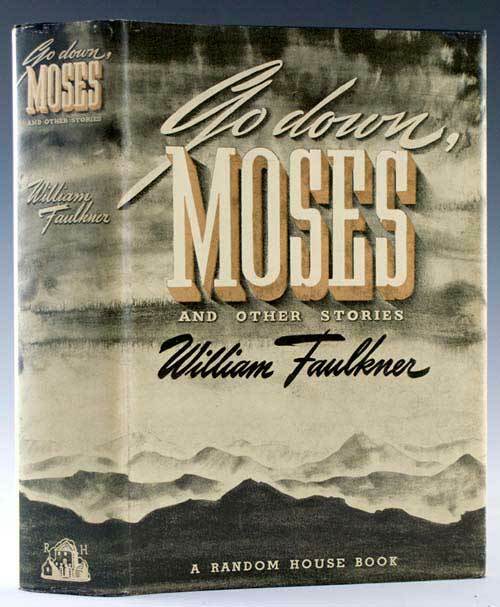 The first-edition (1942) jacket for the novel Faulkner wanted to be called simply Go Down, Moses. Image found here. It’s been a while since I have reported on my progress on the book project. I thought I’d use this post to both comment on that and to do some sketching out of some work on it I’ll be taking up over the Christmas break. To spare the uninterested, the rest of this post will appear below the fold. If you do click to read on, apologies in advance for some of the Inside Baseball quality of what you’ll run into. I’m still transcribing the chapter I discussed in that August post I linked to above. It’s been slow going for various reasons, the chief ones being work and family and professional duties and, this weekend, tinkering with wording and phrasing. (Self-assessment: I wasn’t an awful writer back then, but I had a tendency toward the clever that strikes the older-and-I-hope-wiser me as, now, less attractive.) I’ve also been working new content (some additional comments of my own as well as other critics’ observations) into what I already have, and that has made for slow going as well. Finally, I’ve been thinking carefully about its arguments and judgments. Do they still hold up, in my view? In the main, I think they do, even though I keep reminding myself that just because I am persuaded by them doesn’t mean they are the best arguments and judgments one can make about the theoretical model I’m constructing out of my reading of Faulkner’s “Delta Autumn” and Jorge Amado’s Tenda dos Milagres. So, what I’m describing here isn’t self doubt but being thoughtful and careful about what I’ve been transcribing. The “thoughtful and careful” part has led to the need for the “re-orienting” I referred to in this post’s title. I don’t want to push this comparison too hard, but what I’ll be doing with this chapter is analogous to what someone would have to do when telling someone else what is both right and wrong about the book jacket for Go Down, Moses you see at the beginning of this post. The “and Other Stories” part was not Faulkner’s idea: Random House added that without his approval. Eight years later, when Random House wanted to re-issue the novel, they sent Faulkner an advance copy of the jacket art and, again, added “and Other Stories” to the title. All of that matters because, even though most of the sections of the book had been published before as stand-alone stories, Faulkner worked hard to revise and add material so that they would work together as a unified whole. Secondly . . . get a load of those mountains, would you? They don’t much resemble northern Mississippi, the setting of much of the novel. But they could be said to resemble parts of New Mexico, which is where two of the characters in “Delta Autumn” spend six weeks together as the lovers they cannot be in Mississippi. We learn that in all of parts of two sentences in that section, so I have no idea whether the artwork was intended to represent that space, or any other place in particular. Clearly, though, the space depicted is some place other than Mississippi, and that is indeed keeping with the novel’s big theme of Escape: from the South, from the tragic legacy of slavery. That other space, which I’ve already taken up in detail in the chapter, is a heterotopic one. But here is where the re-orienting comes in: thus far, that discussion is chiefly concerned with rhetoric That is, the space is created by language and not explicitly in or by place. The “Columbus chapter,” though, starts the ball rolling with the land as the starting point for the heterotopic space of the New World, and that fact is something I’ll have to work into this chapter so that they will feel more contiguous than they presently do. This will require a careful rereading of “The Bear” and, in particular, Ike McCaslin’s rhetoric regarding wilderness and the curse he argues was placed on it by, first, the Indians’ accepting the concept that land could be bought and sold and, then, by the introduction of slavery. As for Amado’s novel, I don’t recall much talk in it of the land as an entity–all the more reason, then, to read it again, which I need to do anyway. So there you go: Now you know what I’ll be doing from now until the end of the year!